'Only another oyster would find an oyster beautiful' wrote Dr R.Hedeen in his definitive book on oysters. But to the true afficionado oysters are a thing of beauty. 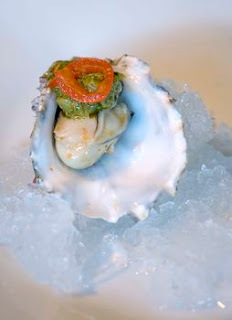 Savour the sheer delight of a succulent oyster feeling it slip, like silk, down your throat - bliss!! It is overwhelmingly extolled for its alleged enhancement of the human libido. Aphrodite, the Greek goddess of love, emerged from the sea in an oyster shell and the legend was born. But is it a legend? Casanova ate 50 raw oysters every morning. Back Chat lifts the veil on the mysterious world of oysters. This is for those who love oysters and for those who have yet to learn to love them. Should your curiosity be aroused and should you wish to know more about these amazing molluscs, please contact me at Back Chat, http://www.leslieback.co.za or email me at les@leslieback.co.za . I would love to hear from you. 'Only another oyster would find an oyster beautiful' wrote Dr R. Hedeen in his definitive book on oysters. But to the true afficionado oysters are a thing of beauty. Savour the sheer delight of a succulent oyster feeling it slip, like silk, down your throat - bliss! Once you have relished your first oyster perhaps you will, like Casanova, begin each day with 50 or so delectable molluscs, at their best and most natural. Serve simply chilled with just a squeeze of fresh lemon and maybe a grind of black pepper (Oyster Nirvana). Ideally, nothing should be added that diminishes their delicate true flavour. Nature provides the added bonus of oysters being a natural source of minerals such as calcium, copper and iron. They are rich in iodine and certain proteins that embody amino acids of which glutamine acid is one. This helps keep the cholesterol low in the blood. They do contain a small amount of cholesterol, so for those with a history of heart disease, the intake of dietary cholesterol should be monitored. Oysters are low in saturated fats and carbohydrates and provide vitamins A, B12 and C. Added to this Aladdin’s Cave of goodness are Omega 3 fatty acids linked to reduction in heart disease. Zinc is its most highly touted property, which plays a renowned role in the development of sexual hormones, is certainly good for circulation and strengthening the body’s immune system, but overwhelmingly extolled for its alleged enhancement of the human libido. Oysters are found naturally in the ocean where they attach themselves to hard structures or rest on the seabed. Predators or strong waves and currents can unfortunately easily remove them. Until recently wild oysters were enough to satisfy peoples’ needs. However, the supply has dwindled and today the problem has become so serious that some oyster beds have vanished entirely - plundered by natural enemies, water pollution and their greatest enemy, man. Fortunately, as far back as the early 1900’s, marine biologists anticipated the situation and realised that new measures had to be taken to cultivate oysters. Farming them in seeded oyster beds using sophisticated methods, which today yield excellent results. The Pacific oyster, regarded as the elite of cultivated oysters all over the world, is indigenous to countries such as Japan and Korea. These have been introduced into the Knysna Lagoon in South Africa and are fast croppers, reaching maturity in eighteen months. Besides the Pacific variety the Knysna Lagoon also cultivates oysters whose seeds originate from hatcheries in Chile and France. When harvested oysters are brought back to land, thoroughly cleaned and graded by size (Cultivated oysters come in cocktail, medium and large sizes). Then placed in crates in well-aerated shallow concrete dams with a plentiful supply of fresh seawater. These dams are drained every day for a few hours, so that the oysters can once again become accustomed to being out of the water. When an order is received, the oysters are removed from the dams, washed and packed for dispatch. Wild oysters are hand picked off the rocks along the coast. They are full of taste and flavour - quite an overwhelming experience - and grow to a size that is impossible to slurp whole and requires a good few bites. Slurping sounds crude, but that is the way it's done! In a nutshell, ( should that be an oyster shell?! ), oceans and hatcheries all over the world provide delicious oysters, some more famous than others. In Europe, the French are renowned for their Belon Oysters, also the green- tinged Marennes. The Belon, native to Brittany, is according to some oyster lovers the most classic oyster of all. It is round, symmetrical, always flavourful and expensive. The Marennes, too, is designated according to the rather complicated French system as superior in quality, while the Fines de Claires are special oysters reared to justify their name and their clarity, the meaning of Claire. America, rich in oysters, has among many others the popular Blue Point, originating in Long Island. The English, their Colchester, Helford and Whitstable oysters. The Irish enjoy Galway oysters, especially during the Autumn Galway Oyster Festival. These are the best of the local native oysters reared in the unpolluted Atlantic waters. It interesting to know that it was as early as the 4th century BC that the Greeks were cultivating these fabulous molluscs. Colder weather announces the season to feast on oysters. The basic premise that oysters should only be eaten in months without an R is challenged by today’s widespread refrigeration, which keeps them cool during hot weather. Oysters spawn in hot weather. Spawning occurs when the oyster is carrying a gelatinous mass of eggs, whitish in colour. They are very simple creatures and their entire reproductive cycle is based on water temperature. When the water gets warm, the oysters get reproductive. There are basically three conditions applicable to a full-grown oyster. First - A fat healthy oyster that is full of flavour. This condition will be affected by the food and fresh water the oyster is receiving. It follows that when an oyster is fat and healthy and full of glycogen, it is often mistaken for being spawny, i.e. carrying a lot of eggs. This is not the case in this instance. Just because the flesh is white, does not mean the oyster is spawning. The Second condition, occurring during summer, is when the oyster changes from being fat with glycogen to being full of protein in preparation for reproduction. Here the belly of the oyster gets soft and creamy. 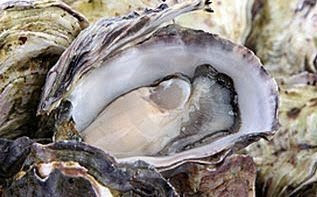 The Third step is after spawning; the oyster becomes very watery and clear and lacking in flavour. Q. Can one eat spawning oysters? A. One can, it is a matter of taste. Q. Are watery oysters inferior? A. No. Again it is a matter of taste and preference. French oysters tend to be thinner and slightly watery, as oyster beds in France are so overcrowded. European chefs prefer this style of oyster. Asian and American Chefs prefer a fat oyster that fills the shell. Q. How does one verify that an oyster is spawning? A. If there are sharp striations (lines and ridges) on the belly, it is not spawning, just fat. Mollusc - belonging to a group of shellfish that are soft bodied and hard shelled. Always keep oysters well chilled until eaten or cooked. When buying oysters ensure they are still alive. An indication of this is that their shells are closed and remain so when tapped. An oyster that is open after being taken out of the water is not fresh and should be discarded. Buy from a reputable store where freshness is guaranteed. Especially choose a store that has a fast turnover. Oysters can be extremely toxic if bad. A bad oyster has a very strong and unpleasant smell, so it is easy to identify. If eaten raw they may carry bacteria that can cause poisoning. 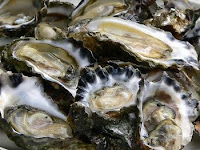 People with impaired immune systems, chronic diseases and pregnant women should not eat oysters. It is important to mention that some people are allergic to shellfish and can experience serious reactions. In these situations oysters must therefore be avoided. Look for oysters that are firmly closed and stored between 5ºC (41degrees F) and 10ºC (48 degrees F). 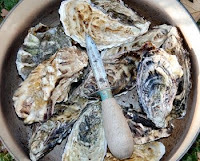 Always keep oysters very cool until eaten or cooked. Fresh oysters can be kept for up to two days and shelled oysters can be frozen successfully for up to three months. Dedicated oyster eaters prefer eating oysters on the half shell, served on crushed ice and as cold as possible. Oysters can be cooked. There are several legendary dishes known to oyster fundis. Delicious Angels on Horseback, Decadent Oysters in Champagne, Fascinating Oysters Florentine and exciting Garlic Baked Oysters to name a few. They are special in soups, sauces and many other exotic dishes. Never overcook them or you will find them curling at the edges. Opening oysters or SHUCKING, as this process is known, requires a special knife or implement. This takes skill and practice. The trick is to open it without losing any of the liquor inside. Not easy. Some oysters are stubborn and do not take kindly to being tampered with, so be careful not to cut or stab yourself. A tough knob on the underside connects the oyster to the shell and has to be severed in order to open it. Open it – fork out the oyster and drink the liquor from the shell – heaven! However, easier said than done. If eating in a restaurant, they will do the hard work for you. What to drink with oysters? Here personal taste prevails. The famous combination is Oysters & Black Velvet. This is a mixture of champagne and creamy stout. Champagne on its own is a perfect accompaniment. Crisp dry white wine is also ideal. the world of oyster lovers and may every oyster meal be a special occasion.